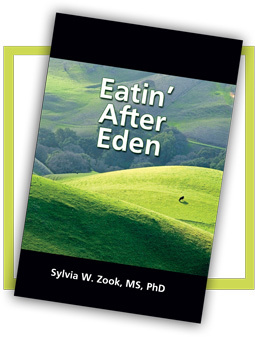 The majority of the readership of Eatin' After Eden would like Dr. Zook's position on the Paleo fad diet (PD) and we offer it here in brief form. The detailed article is for another time. For the nonce we are providing some principles here---something for our readership to chew on immediately. First, as a lucrative, deceptive imitation, the PD is ever evolving and very popular---a diet with a foundation of the theory of evolution, without written record. "Modern Paleolithic" eaters (an oxymoron and often shortened to “Paleo Diet” or referred to as the, stone age, cave man, or hunter-gatherer diet, promote the supposition that mankind evolved for millions of years before the Neolithic period and that this eating plan consist of the plants and animals that man ate for about 2.5 million years until10,000 years ago when he began the grain-based diet. Such proponents beieve that the Biblical agrarian society harmfully changed the human diet and health. (Have you too noticed the never ceasing changes and removal of the old landmarks, whatever they may be, food, language, dress, music, marriage, Holy Bible versions, history, etc.?) Yes, and sound nutrition of organic, fresh, whole foods. Yet truth never changes. Like many counterfeits and certainly compared with the Standard American Diet (SAD) and many others, the PD offers much that is good. The Deceiver will sacrifice nine points of truth for one gargantuan lie, it is said. For example, with many versions of the PD one may avoid five chief cancer-causing foods, especially if one consumes all organic. Meat, seafood, and fresh fruits and vegetables should make up the most of this diet, the first two foods promoting satiety with their high protein and good fat, the same as eggs properly prepared. Yet the PD is a figment of the imagination, an imitation of the Creator’s plan for eating foods He provided, prepared as He instructed, for bodies He designed, with an extraordinarily well written record of thousands of years as explained in Eatin' After Eden. Of course no one could know what humans would have eaten had they been on earth 10,000 years ago and before, presuming there was an earth that long ago. It is for certain human kind would not have consumed much of the faux-foods suggested in many of today’s PD recipe books that appeal to carnal apatite with addictive sugars, flavorings, and other that did not exist even a century ago, certainly not processed foods. On the other hand, the Creator has provided extensive specifics as to His eating instructions from the beginning. Some texts require good science to “flesh out the bones” by a qualified nutritionist (the Bible is a closed book to non-Christians it tells us). This is vital to explain the functioning of the human body before and after the fall, what it provided itself before, and certain foods and nutrients available then (have you seen this in any resource other than EAE? ), and their relative modern equivalent, as well as today’s most reliable scientific studies (many are not to be trusted), for best understanding. This fad diet, the PD, avoids entire groups of foods. It follows a grain-free meal plan that is unhealthy for most, These foods include proteins, complex carbohydrates, phytonutrients, and high fiber. Spelt, a highly nutrtious grain mentioned in Scripture, ist more easily digested than hybridized grains the world consume today. Yet it is still available today--the same as Joseph had the Egyptians store for famine--the most superior being the organic, sprouted one available online. Many Paleos hold that only food that can be eaten raw should be included since the supposed Paleos would not have cooked. (Scriptures’ ancients cooked foods as instructed by the Creator and Biblical example since some nutritious foods are not well digested raw. Further, the PD is yet another weight loss diet. The EAE diet is instead the Master’s plan that builds health that leads to losing excess and maintaining proper weight, cholesterol, etc. The Australian Family Physician reported studies to show that benefits of the PD may be exceeded by nutritional deficiencies to be found following this diet. Without dairy cereals, calcium intake alone may be 50% less than the recommended amount. The same nutrient value in other diet is approximately 10% less expensive. These reviewers of all published studies concluded ",,,there’s no significant difference in glucose and insulin levels for the paleo-type plan." 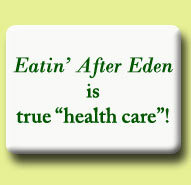 As with any counterfeit the non-creator has been providing since he appeared as the charming, persuasive serpent in Eden deceiving Eve as to the benefits of that fruit, the PD has similarities to God’s plan that is not a diet but a life style leading to restoration and maintenance of health and wellness. The divine, real thing, is based upon a Scriptural foundation with true nutritional science (versus "junk science") that agrees. Those details are to be included in the forthcoming, complete article. Scripture and its principles for providing the body what it needs to detoxify and heal itself, and to maintain health and wellness after Eden, have never changed. We have a number of testimonies of life extension of 10-15 years by many years for those following His plan of life. We have not suffered colds, flu, or other contagious conditions for perhaps 30 years and well into advanced age; profoundly demanding times, very high stress load, etc., e.g., working 14 hour days 6 days/wk. even during a lifetime of a powerful brain tumor and endocrine disrupter that led to a nutritional research and counseling career before divinely healed; during months of a flood; an horrendous fire requiring 18 months of recovery of every kind while dealing with the yet unhealed brain tumor; and loss of children; and more. Even gardening with depleted soils as compared with Eden, all this indicates the incredible efficacy of the Creator’s plan for providing our bodies what they need to heal and maintain health and wellness works remarkably well amidst today’s inescap-able highly toxic environment! We have not met a Paleo who claims this. Disclaimer: This information is for educational purposes only; it is not to diagnose, prescribe, treat, or to prevent, mitigate or cure any human disease.